Steel horses: Being a biker in Halifax is about the speed, the sound and the love of the machine, by the rider and the spectator. Bikers and their machines make the scene on Spring Garden Road. Two teenage girls run over to three bikers who've just put their helmets on. "Hey, can we get a picture with you guys?" they ask, with huge smiles on their faces. "Sure, yeah, why not?" is the general consensus. The three friends, who were just about to leave the harbourside, wrap their arms around the girls and pose for the camera. A hesitant dude with a turquoise point-and-shoot camera snaps the photos for his two friends. A few profile pictures more, and the troupe departs, nodding their heads as they go. These aren't celebrities, even by Halifamous standards (no offense, fellas). Haligonians just love seeing bikes in their city. "People like to show off their bikes," says Dwayne Gannon, gripping the handlebars. Gannon's bike is primarily black and chrome, with some barely noticeable burnt orange detailing along the sides. The Harley Davidson emblem is branded onto both sides. He walks around his machine with pride, laying his black gloves, helmet and jacket on the seat. "I love driving around, that's why I do it, but for some reason this spot, there's something about it," he says. 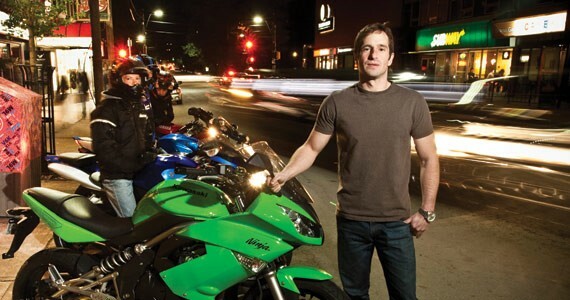 On almost any given night you can usually find a group of motorbikes parked around the waterfront landmark, the downtown clock, centre of a seemingly pointless cul-de-sac between Murphy's Cable Wharf, the ferry terminal and Stayner's Wharf. Anything from cruisers to sport bikes to Vespas ---if it's got two wheels, this is the epicentre. Here the bikes often take centre stage, despite the many street performers and musicians along the water. People stop and gaze at the painted flames, the lime greens and bright reds. The roar of their engines doesn't hurt either. "There's some really nice bikes out there," Gannon says, with sunglasses atop his head. "[Bikers] do what they can by adding unique elements to them, making it their own." Kids especially like to see the bikes up close, and most riders are willing to oblige, it's only the rare douchebag that says, "Hey, buzz off." "For a lot of people it's all about the show," Gannon says, conceding he would rather be riding. "They spend a lot of money and a lot of time taking care of their bikes and they want to people to see it." Gannon and his two buddies, who came down to ride with him from Yarmouth, look around with their hands on their hips, "Well, there's a Timmies over there, we could grab a coffee." And off they go, leather chaps and all. As gas prices continue to rise and public scrutiny of greenhouse gases increases, some may think that this hobby would be on the decline. Not so, says Nick Daaboul, who has a sport bike---or "crotch rocket" as they are somewhat derisively referred to---of his own. "If anything, more people are biking now instead of driving cars," Daaboul says, standing wide-legged next to his red and black Honda sports bike. "It's so much easier to fill this tank and get around than those poor people driving cars." Daaboul works for Ecycle Solutions, a company that recycles electronic components. He says he's an environmentalist at heart. "It is a waste to drive around on your bike for the pure pleasure of it," Daaboul says, but then shrugs. "But when you consider the amount of fuel spent on cars and trucks just going from point A to B, it's not as bad." When the lights go down, many of the shops in the downtown core close as the workers head back to their suburban homes. With most stores on Spring Garden closing around 6pm, a lot of the foot traffic on Halifax's busiest street is gone. The bikers could not be happier about this. "Traffic, traffic, traffic," Daaboul says, his skull helmet in hand. "There's way more freedom at night without having to constantly stop and go." The night can also be a big factor with bikers more interested in the show aspect of their hobby. Applying neon lights, bright colours and other techniques really stand out when the sun goes down. Some other bikers---not Daaboul, according to him---like to come down at night for the women, who seem extra impressed by the machines when the sun goes down and the bars fill up. You get the odd lone wolf, but biking is generally a social experience. You get together, ride downtown or wherever you want to go, and then grab a bite or just chat. "Once you start you can't stop," Gannon says. "It's just more fun to ride when you're with people," says Daaboul, pointing at his compadres who also have sport bikes; one is a Honda like Daaboul's but orange, the other a Kawasaki. "It's like sports---sure you can practice basketball by yourself, but when you get other people playing, you've got a game going." The three amigos, including Daaboul, have found what they came for---another group of bikers, all in different colours. They roar their bikes to life, get situated, putting gear on and stretch. They take a quick look around and begin departing, one at a time around the downtown clock. The one in front of the pack, lifts his front wheel in the air as a sign of what? Defiance, satisfaction, bliss? They all leave the circle one by one, as people in the area stop to watch. It's a spectacle and they love it.